In early 2016 a new database was launched on the Web of Science platform—Russian Science Citation Index. The database is free to all Web of Science subscribers except those from the post-Soviet states. This database includes papers from 652 selected Russian journals and is based on the data from national citation index—Russian Index of Science Citation (RISC). RISC was launched in 2005 but it is scarcely known to the English-language audience. The paper describes the history, current structure and user possibilities of RISC. We focus on the novel features of RISC which are crucial to bibliometrics and are unavailable in the international citation indexes. The present study is an extended version of an article presented at the 16th International Conference on Scientometrics and Informetrics, Wuhan, China, 16–20 October 2017 (Moskaleva et al. 2017). We are grateful to Gennadiy Eremenko, CEO of eLIBRARY.RU, for his invaluable help. We thank Natalia Maksimova, Higher School of Economics Library Director, for arranging HSE access to bibliometric databases and her continuous support. M.A. thanks RFBR/RFH for support of this research (grant #14-03-00333). We also thank Vasiliy Pislyakov for his help in data mining. Gibson, J., Anderson, D. L., & Tressler, J. (2012). Which journal rankings best explain academic salaries? Evidence from the University of California. Working Paper in Economics 10/12. University of Waikato. Retrieved January 08, 2018, from ftp://wms-webprod1.mngt.waikato.ac.nz/RePEc/wai/econwp/1210.pdf. Wouters, P., Thelwall, M., Kousha, K., Waltman L., de Rijcke, S., Rushforth, A., & Franssen, T. (2015). 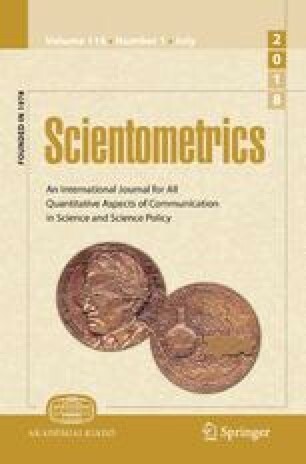 The metric tide: Literature review (Supplementary Report I to the Independent Review of the Role of Metrics in Research Assessment and Management). HEFCE. Retrieved December 12, 2017, from http://www.dcscience.net/2015_metrictideS1.pdf.